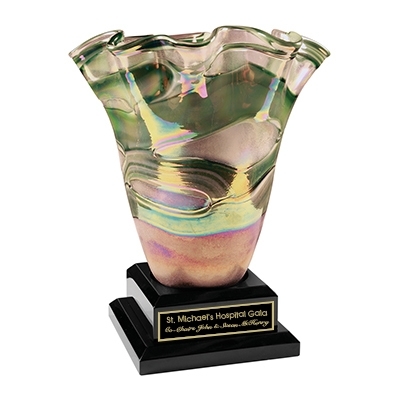 Our striking rainbow fluted artistic vase is a true work of art! Each one is hand-made blown glass so sizes and colors will vary and small air bubbles and imperfections are characteristic of this unique type of art glass. No two are exactly alike! The vase sits on a Black Piano finish base (unattached) and comes with a Black/Gold plate for your text and/or logo. This award is sure to impress! The vase and base are boxed separately. The vase is safety packed in a brown cardboard box (gift box not available).